Scallywags have been holding Leaps and Bounds with our Preschool children for over eight years now and we are huge fans! The children’s progress is evident and they have all come along in ‘leaps and bounds!’ Their confidence has increased along with their physical and emotional development. Over the eight years we have seen vast improvements in our children’s development as they spend up to two years doing Leaps and Bounds once each week. Sylvia, our special Leaps and Bounds instructor is a real credit to the sessions, she really gets the most out of all the children involved and even the staff have fun joining in! Sylvia is committed and so enthusiastic making every session so different and exciting! They can’t wait to line up at the end of each session as they succeed in their goal and receive their sticker! We find these everywhere in the Preschool room! We hope to support Leaps and Bounds for years to come! 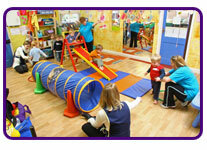 The children at Scallywags have enjoyed Leaps and Bounds every Friday since 2004. The children look forward to a Friday as they know that Sylvia will arrive with her car full of equipment. The children are in two groups the 2-3 year olds and the 3-4 years olds. Some of the children have enjoyed Leaps and Bounds for a very long time. I feel that Leaps and Bounds is a fantastic way for the children to develop their gross motor skills making it fun and enjoyable for all involved. It amazes me how much the children benefit from having these sessions. It wasn't until recently I realised how much. We had a number of new children join in and the difference between the children who are at nursery every Friday to the children who aren't was amazing. The marked difference in the way the children climbed the way Sylvia had showed them just showed me how much these sessions were beneficial. Sometimes for the children the half an hour session they have is simply not long enough!! When it comes to sticker time there are a few groans that they want to carry on. It was lovely to meet you at the Busy Bears Nursery,Durham last week.Just a small note to say a big thankyou for running these sessions in the nursery and we believe our daughter's physical development has truly come up in leaps and bounds even after just 8 weeks, thanks to your structured programme. She used to take great pride in demonstrating her skills learnt from each session when she returned home on wednesdays. She is now ever so ready to take new challenges with jumping,landing,balancing etc that sure catches eyes when we take her to different places/play areas etc. The course sure has made her more confident in many a skills at a very early age. As medics involved in care of children we have already recommended this programme to folks we have met and will continue to do so as we believe it encourages children as young as 2 to get involved in physical activities which certainly will have a huge impact in their lifestyle when they grow up. Thankyou again and we look forward to seeing our daughter's future sessions after the summer break..
Subhan and Dagny Christudas, parents of child 2/3 group,Busy Bears Nursery,Durham Wednesday pm. "We have just come to the end of our first block of Leaps and Bounds. I have to say that the progress our children have made has been fabulous. From the first session the children have and lots of fun and enjoyment. They have gained many skills through Leaps and Bounds, Susan knows each child by name and how each one has developed their own skills since starting the programme. Even the children who have not participated in this first block know Susan and know it is Leaps and Bounds day. The children love participating and love to collect their achievement stickers at the end of the sessions. Children have been seen to blossom since the start of classes, their confidence, independence and physical skills have progressed at an amazing pace. It is wonderful to see children developing and moving forward in many areas of their development, but the main thing is that they are having fantastic fun. Parents have remarked on their own children's progress and have been amazed at how confident they have become since starting Leaps and Bounds. I look forward to more Leaps and Bounds in the Autumn term." "The Leaps & Bounds leader is always punctual and prepares for the sessions well for the ages and abilities of the children. She is always cheerful and enthusiastic and that made the children eager too as they anticipate for the for the sessions start. The equipment that Leaps & Bounds provide for each session varies from week to week so there is always something different to look forward to. The children expirience new physical challenges through these sessions and enjoy the songs, rhymes and ring games too. The Leaps & Bounds leader is a pleasure to have; she is always smiling and has a fantastic sense of humour which the children and I adore. "Our children have a fabulous time at the Leaps and Bounds classes. They are on the 2nd set of classes now and they absolutely love it. They have all developed their physical skills really well and we are delighted with the impact that our classes has on them. Parents are keen for the children to continue with the programme as they can see how much their children get out of them. We would highly recommend Leaps and Bounds classes". "My daughter Millie absolutely loves Leaps & Bounds, we as parents have noticed how much more confident she has become and how well her balancing, catching and general motor skills have improved in such a short space of time. Millie can't wait for the class each week and we would recommend it to all parents. It's certainly Millie's favourite activity and I hope that many more schools and educational practices offer Leaps and Bounds as it's such a popular and important way to learn in a fun filled way. Thanks for the success of Leaps & Bounds at Busy Bears. The children love the activity and it brings good variety to their daily routine. Their progress from start to end of the programme is excellent and the children do look forward to the weekly event. Staff are pleased to see how the children progress and improve weekly, and parents in turn are delighted that their children are both enjoying and learning at the same time. At Busy Bears we have great facilities with enough space indoors (and outdoors if the weather is very sunny). This in turn maximizes everyone’s enjoyment. We are absolutely delighted with the Leaps & Bounds programme. The staff have noticed such a difference in the children - in their confidence, their self-esteem and their flexibility. The children have thoroughly enjoyed the session and the leader has been really wonderful with the children and must have the patience of a saint! Older children enjoy weekly Leaps & Bounds (Tumble Tots) sessions, which provide further variety to their physical play. Children are very enthusiastic when particiapting in these sessions and are gaining good control of their bodies. All children move freely and confidently within designated areas of the nursery. They delight in the excellent range of activities, which they tackle enthusiastically.